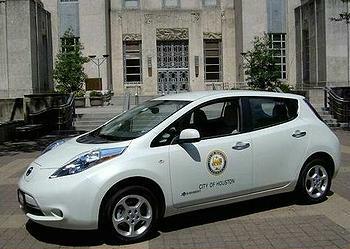 HOUSTON, Texas, August 24, 2012 (ENS) – The Zipcar car sharing network has crafted a new partnership with the City of Houston for a municipal electric vehicle fleet-sharing program that is the first of its kind in the country. Under the Houston Fleet Share program, 50 existing city-owned fleet vehicles, including 25 electric Nissan Leafs, will be set up with Zipcar’s FastFleet proprietary fleet sharing technology for use by city employees. The Nissan Leafs have zero tailpipe emissions, and it is estimated that each vehicle will save up to $8,000 in fuel and maintenance costs over a three-year period. The first municipal EV sharing initiative in the United States, Houston Fleet Share is designed to help the city improve efficiency, promote sustainability and save money without sacrificing employee mobility. “Houston is setting the pace for sustainability efforts, and we are very proud to be working with Zipcar to launch the nation’s first-ever municipal EV green fleet sharing program,” said Mayor Annise Parker. “Although we’ve always been known as the oil capital of the world, we’re gaining momentum on being the energy capital through programs like Houston Fleet Share and the Houston Drives Electric initiative,” said the mayor. Houston now has the third largest municipal hybrid fleet in the country, with hybrids making up about half of the nonspecialty, light-duty vehicles in the city’s entire fleet. The City of Houston selected Zipcar as its fleet technology provider through a competitive bidding process. With Zipcar’s FastFleet technology, the city will be able to design and configure its fleet footprint in real time for optimal utilization; manage hundreds of critical activities including preventive maintenance, fueling, billing, and fleet distribution; analyze the usage and diagnostic data that is automatically captured during every trip; and utilize Zipcar’s analytics to stay on top of trends and in control of its fleet. “By utilizing Zipcar’s technology to make our fleet usage more efficient, we will be able to further reduce emissions and cut back on fleet fuel consumption, helping save money while also having a positive impact on our environment,” said Mayor Parker. The program is funded by the State Energy Conservation Office American Recovery and Reinvestment Act Transportation Program as part of President Barack Obama’s economic stimulus effort. Zipcar’s FastFleet technology has been adopted through similar initiatives in Washington, DC; Chicago and Boston. In 2009, Washington, DC became the first city to use the Zipcar technology in their fleet, allowing fleet operators to eliminate cars, save money and reduce emissions. Officials with the District of Columbia estimate that they save $1 million per year using the technology. Zipcar boasts 730,000 members and 11,000 vehicles located in metropolitan areas and on college campuses throughout the United States, Canada, the United Kingdom, Spain and Austria.